Update: KA Lite dropped us a line to let us know they had a newer version of today’s post ready for us this evening, that they’d prefer us to use. The updated version is below. Enjoy! Liz: We’ve been talking a bit about Khan Academy Lite on this blog recently. KA Lite is the offline version of Khan Academy, and we’ve recently seen the Kingdom of Bhutan’s first Raspberry Pi being used as a server to give kids offline access to the huge, free suite of Khan Academy’s top-quality video lectures and learning materials. You can read more about Khan Academy on their own website, but don’t just take their word for it: there’s a wealth of material online about the Khan Academy learning experience from users, if you have a few minutes to google for it. Following brainstorming and feedback from organizations, the design specifications shifted towards a platform that could run on any operating system, on any low-powered hardware (with the Raspberry Pi as an exemplar device), and with mechanisms in place to synchronize data and share new content through any existing channels. Development then began, outside regular working hours, on what became KA Lite, a standalone dynamic web platform that was demoed to Khan Academy at the end of the summer internships in September. In the fall quarter, at UC San Diego, a team of passionate undergraduates, joined later by graduate students, jumped on board to apply their development, design, and user experience skills to build out and improve the platform. In December of 2012, the KA Lite team first announced the open-source project publicly on popular developer channels, and developers around the world soon began contributing and collaborating on the development process, while teachers and organizations in many countries started testing out deployments with their students. The Raspberry Pi was not only the original inspiration behind the KA Lite project, but continues to be the most cost-effective way to deploy the platform to areas without existing infrastructure. While we had originally envisioned the Pi primarily as a client device, it has proven itself to be an ideal server platform for bringing KA Lite to offline communities. With the addition of a cheap wifi dongle, and a bit of software setup, the Pi is transformed into a standalone wifi access point that can serve up a dynamic web interface to nearby client devices, without the need for internet. We were unable to swamp the Pi server or its wireless connection even with 35 tablets connecting to it simultaneously. 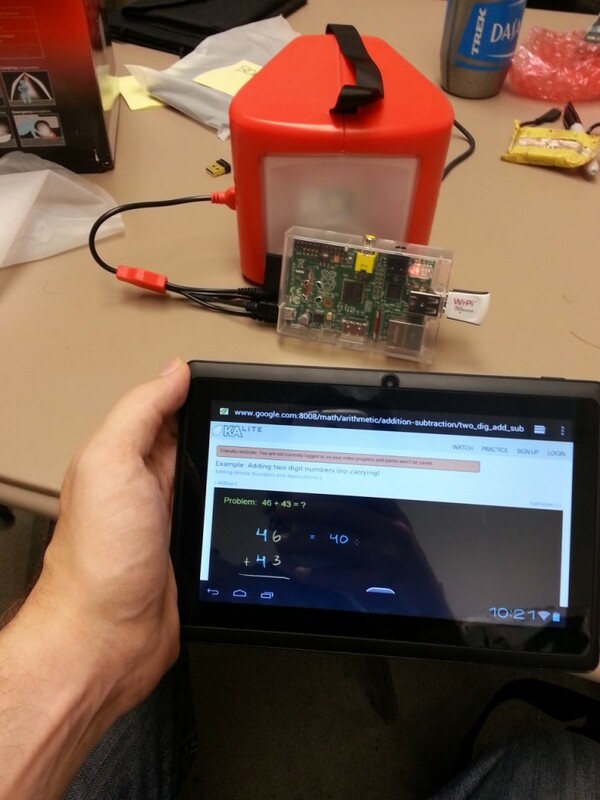 Inexpensive Android devices, which have been proliferating through the developing world, serve as excellent client devices to connect to a Pi access point. 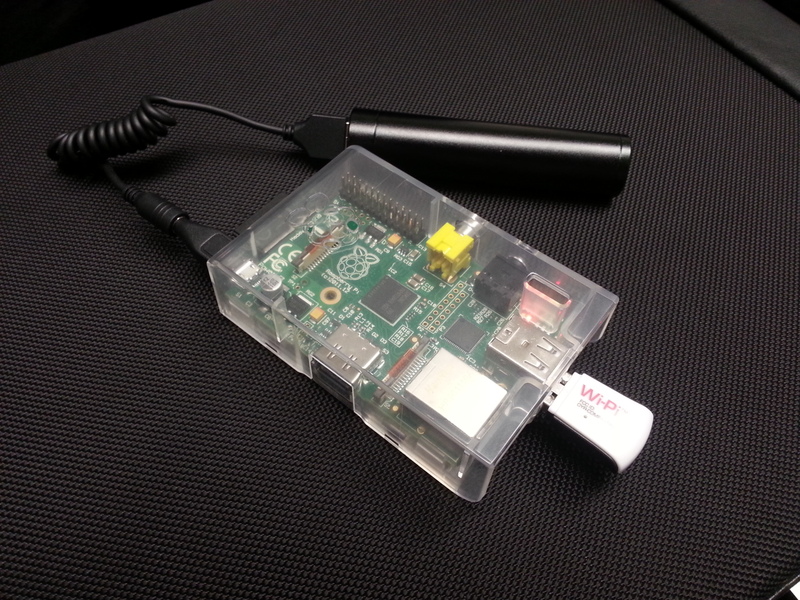 How does the Pi hold up to the task of serving a classroom full of tablet users over a single wifi dongle? We had been warned that a small number of wifi clients would likely swamp the connection, so last week we put it to the test. 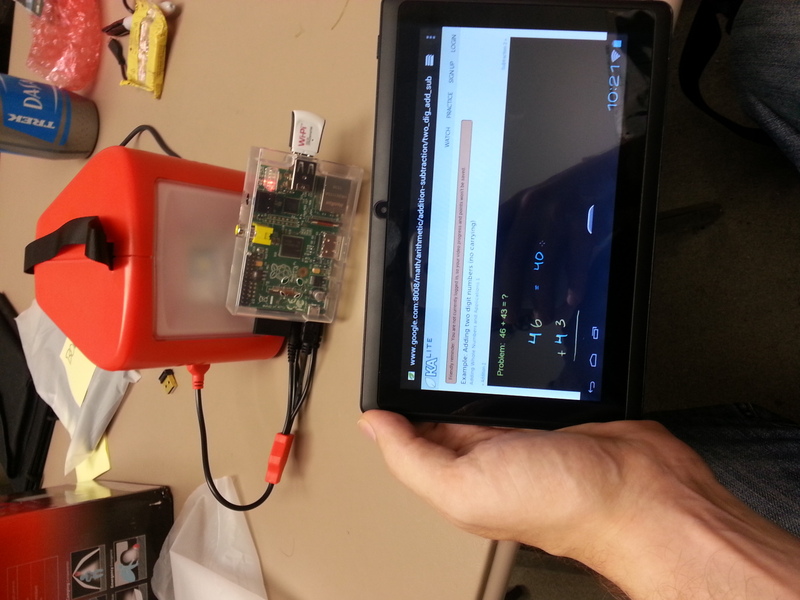 The Raspberry Pi/Wi-Pi combo held up smoothly, with 35 tablets simultaneously navigating through the KA Lite web interface and streaming Khan Academy videos. We’re experimenting with alternate power sources, such as the solar-charged d.light that is already in wide distribution through the developing world. The Pi’s low power requirements make this a breeze. If you’re interested in helping to develop KA Lite or want to deploy it with your students, check out the KA Lite Wiki for more information on how to get involved! Would there be a way to integrate into KA-Lite, for the benefit of a Spanish-speaking student of mine, a number of Khan Academy videos, in Spanish, which I got from the Khan-on-a-stick project ? If you’re going to be running the Pi off a battery, and using only WiFi and not wired ethernet, I believe the Model A would offer longer battery runtime. But if you read the other post about KA… I gather that they waited a very long time for their Pi and it cost them a very dear (more than £30) amount! Last time I checked the U.S. distributors a few days ago, they were still limiting us to two Model As per order, although that’s a big improvement over not being able to order any a month or so ago. There may be an institutional volume quantity ordering procedure that I haven’t tripped over in an obvious place. I seem to recall Allied being able to accommodate that with longer delivery terms, but given that they and RS were still shipping 256 MB Model B boards at least a week after the 512 MB upgrade was made available, I’m not sure I want to order anything that isn’t coming from stock today from them. I don’t know what bitrate those videos are, but that is impressive to me- has anyone else tried 35 active wifi connections to one Pi? Maybe they sync the videos to the tablets first and then watch them from the tablet’s SD-card. The videos are between 50-500kbps, and buffer quickly in the first few seconds over the fast local network connection (the SD card, if slow, may be a bigger bottleneck than the network connection). So, “streaming” may not have been the best term. But yes — we too were surprised that the wifi dongles were able to handle so many clients simultaneously (we had expected we would need to use separate wifi routers). We had some issues with the Edimax EW-7811Un dongle after being connected for a while (started getting slower), but no such problems with the Wi-Pi dongle. Raspberry Pi, the little engine that could. Very impressive and a testament to all the work the community have done to improve Raspbian. Does anyone know what specific android tablet they are using? Can someone tell me what brand that battery is? An impressive project – but locally created content is “not available at this time” according to their FAQ. It’s a web server, can’t you serve web pages from it? You can certainly serve other content from the Raspberry Pi! The FAQ answer is referring to the KA Lite web stack itself, which right now is tailored to navigating, serving, and tracking progress on Khan Academy content. In the future, we aim to build it into an offline “web” platform for authoring, curating, and distributing other educational content. My son uses Khan Academy but he doesn’t have internet at the church where he studies so KA Lite is an awesome solution while there. However, he would like to get credit on the regular Khan Academy account for the things he does on KA Lite, perhaps by linking the accounts. Is this possible? And if so, how can it be done? I found your article and would like to introduce a project I am working on. I think it is relevant to your article and the interests of your readers and I would really appreciate it if you could post a little information about the project for your readers. I would be open to doing an informal interview if you are interested in that too. The project I am working on is a Raspberry Pi Computer Lab in rural Swaziland. Swaziland is a developing country and is classified as middle income, but that is largely due to the huge disparity between the rich and the poor here. This lab will give about 630 students access to computers in a village where technology as such is rare. The lab is geared to be low cost and simplistic and can serve as a model of how much can be done with very few resources and a little know how. This style of computer lab is more accessible to children than even the One Laptop Per Child XO laptop. This is because the Raspbery Pi does not need to marketed directly to the ministry of education, nor does it have to be ordered in quantities of thousands in order to get into the hands of children. Computing in the rural world is important for many reasons. Computers and information technology are promising ways to empower people in developing countries with the information they need to make informed decisions for themselves. In addition, IT can enhance the local economy by imparting skills and access to resources in the people, can provide creative outlets for many children through recording programs, writing, programs, and even basic programming tutorials. Please take a look at the campaign here and contact me if you have any questions! Best email us – this is quite an old post, and the comments won’t get many views. I’m [email protected]. My name is Adrien Shen, an American volunteer in Cambodia, and I decided to contact you because it seems we are virtually doing the same project just in a different location, slightly different times, and perhaps under different infrastructure and cultural influences. I am in the process of trying to create a raspberri pi server computer lab at a rural primary school in Chiro Krum village, Kampong Cham province, Cambodia. 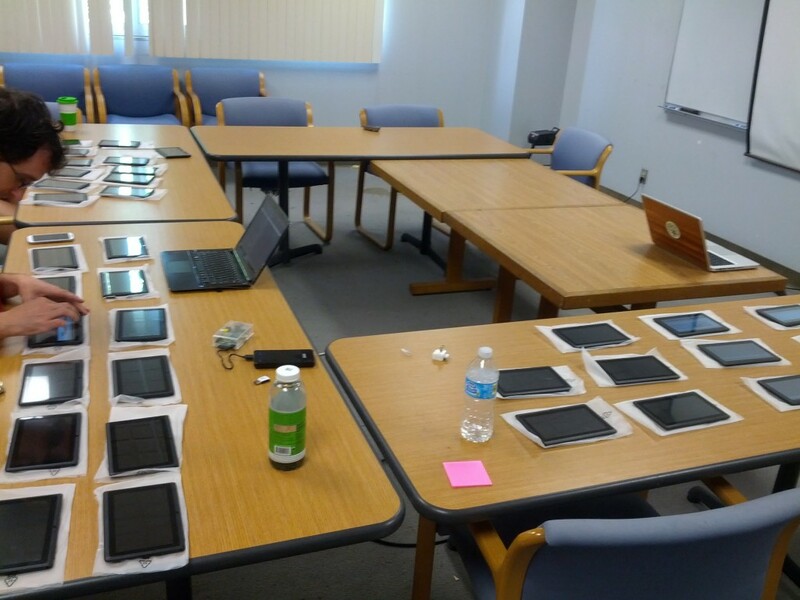 My basic idea was to use a couple raspberri pis + 10-15 cheap android tablets to run servers for Khan Academy and Rachel Foundation content. A peripherals and small device cost and I had estimate the project needed about 1500 usd. which was all generously funded by a Swiss businessmen who I met prior to the project. In the beginning, it seemed very simple and easy, but recently Ive been running into one problem after another, whether it was the rudimentary infrastructure, daily power outages, or extremely corrupted Cambodian mailing system (i had to ship most of the hardware from outside the country as Cambodia doesn’t have too much in choices) sometimes it makes me wonder if the project will ever be finished. Maybe it’s because I am too not to experienced in IT, but I had a veteran networking and securities specialist for a while and there just seems to be a fixed difficulties in doing anything technical because of the rural environment, close to zero infrastructure, and difficulty to obtain materials we need, for example obtaining a SD card thats not a counterfeit. Apologies for all the previous complaining, not my intention, but I was wondering what you project experience in Swaziland was like. Surely there are some similarities, and many differences. And how did it all turned out? Are you finished or still in process. All your experiences will helpful for me in seeing this through.